The Daughters of Charity currently observe their year-long celebration of the Company’s 150th anniversary of transforming presence and service in the Philippines. Since their 22nd of July Province-wide Legacy Night celebration, each DC institution/ministry takes its turn in observing its own version of a Legacy Night throughout the year culminating on 22 July 2013. 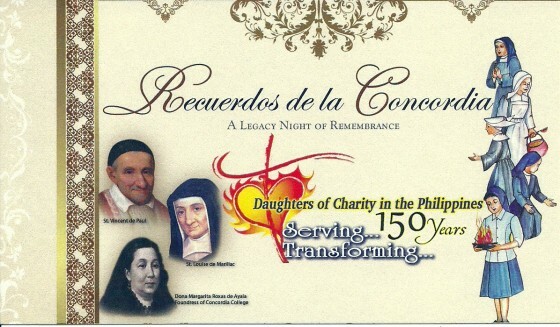 On 7 December 2012, at five o’clock in the afternoon, Concordia College shall hold a two-part Legacy Night of Remembrance – “Recuerdos de la Concordia”. This shall be held at Concordia’a Main Arcade, located along 1739 Pedro Gil Street, Paco, Manila. **La Concordia College is where Saturnina Rizal studied.